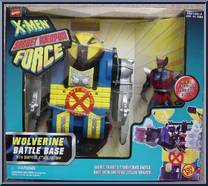 Hidden inside a simple-looking machine is Wolverine in his surprise attack battle base! Appearing to be nothing but a harmless instrument, Wolverine’s battle base conceals not only our hero, but a host of powerful weapons as well. 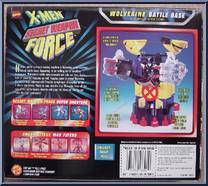 Popping open to reveal Wolverine, the battle base automatically fires its compliment of missiles at the X-Man’s opponents. Ready to leap into the fray, Wolverine fires off the rest of the battle base’s missiles and pops his claws so that he can finish the fight personally!